How things have changed in just the past year in how we consume email. It was recently reported that iOS crushed Android this holiday season with five times the number of sales and spending nearly twice that of Android users per order. Email usage data shows similar trends based on mobile OS, so maybe in 2014 we can all stop arguing that Android emails were just undercounted because images were off. What else did we see in our email open data this year? We looked at nearly 1.3 billion opened emails to find out. Mobile! 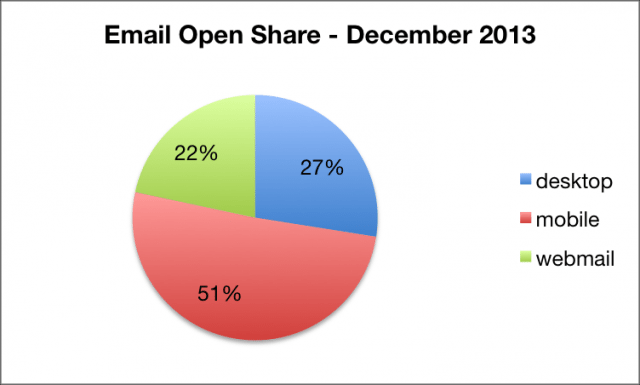 At 51% of email open share this holiday season, mobile finally claims the #1 spot for consumers opening and reading emails, and it shows no signs of slowing. If the current trend continues, mobile could account for up to 60% of all emails opened. 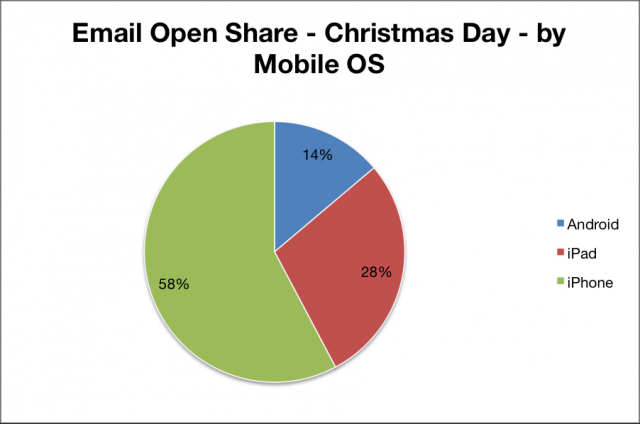 Christmas day saw the highest share of email opens for mobile with 62% of all emails opened on a mobile device. 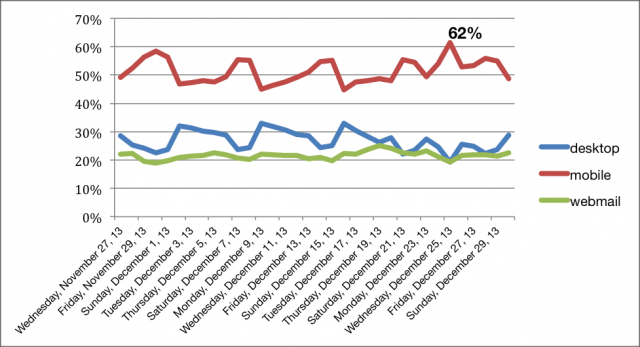 57% of all Christmas Day mobile opens were on an iPhone, and 28% were on an iPad. 14% of all emails opened were on an Android device. 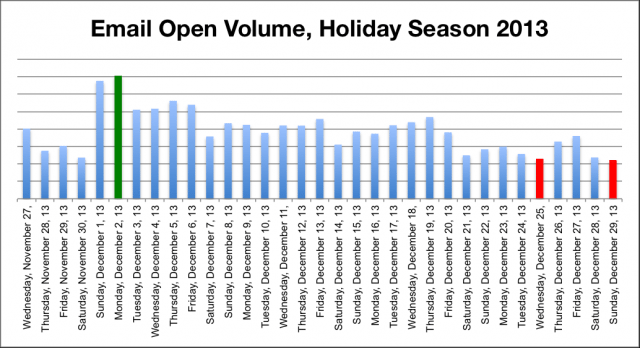 Volume-wise, CyberMonday saw the most emails opened during the holiday season with the day before CyberMonday coming in second. Christmas day and December 29th saw the lowest open volumes, which isn’t surprising considering businesses are sending fewer email campaigns on Christmas day. Maybe we do like to spend time with our families instead of staring at glowing screens? The 29th could be a result of people traveling back home from Christmas. 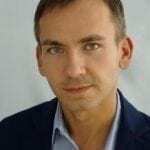 There wasn’t a single day this holiday season where Mobile wasn’t the preferred platform to read emails, but there were still patterns in its usage, as well as Desktop and Webmail. Email open volumes on mobile rose on days off, namely weekends and holidays. As people returned to work on Monday, Desktop email opens increased and gradually decreased through the working week and dropping off significantly during the weekend. Webmail stayed mostly flat with 1 in 5 people reading emails in a browser in the webmail UI, but Thursday was the preferred day for people emails in webmail. Gmail saw the largest rise in opens during this period, but not because of more people using Gmail, but because Gmail started to enable images by default for all. Gmail currently stands second to Yahoo! Mail. AOL, once the most widely used ISP and email service in America (heck, they even made a Tom Hanks movie out of it) now stands in 5th place after Comcast. Will we see mobile top 60% of all emails opened in 2014? Will Android users start using their phones in the new year, too? Place your wagers in bitcoins in the comments below.